I mentioned it a couple days ago, there’s a new Harvest Moon Cafe. This new cafe is only partially furnished but it is very different than the old cafe. For one thing, it’s got two stories and while the first story is a more traditional cafe, the top story is the home of our Hosoi Ichiba affiliate store. I’ll be writing more about the cafe in the future, but here’s a preview of it in it’s new location on The Meandering Pond. 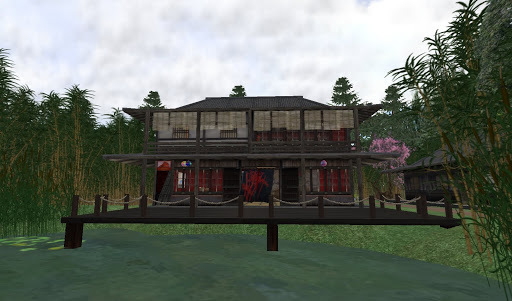 This entry was posted in Features and tagged Creating & Building, Photography, Second Life, Zen Gardens. Bookmark the permalink. Hugs…thanks for giving me a sneak preview yesterday. You knew I couldn't wait. It is time to break it in……When is the party?